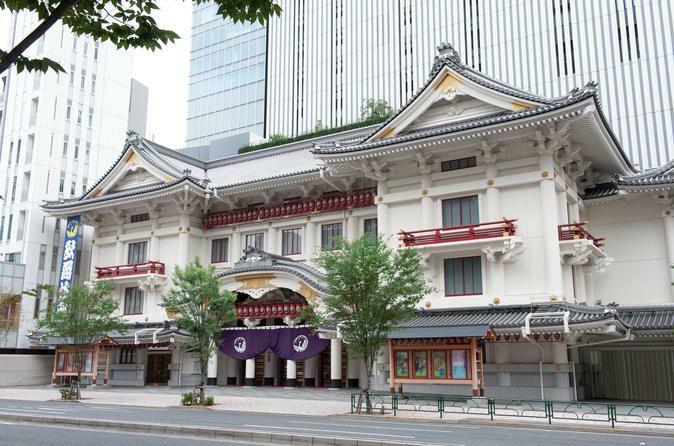 This is a join in tour and a guide will meet you in front of Kabuki-za, and pass you an admission ticket. Then guide will introduce about Kabuki's history and meanings. After the introduction, guide will leave from your party and you may go inside the theater on your own and leave from Kabuki-za anytime you want. Come and experience the most popular traditional Japanese theatrical art, Kabuki. This program is not just ticket arrangement, but knowledgable guide will briefly explain you about Kabuki history. The Kabuki performance is a bit complicated for even Japanese people, however with this program the guide will inform you and answer to the questions you might have before the show begins. You will be able to sit on the 3rd floor of the theatre giving you a nice view of the performance as a whole. Kabuki is a style of classical Japanese dance-drama theatre known for its elaborate make-up, costumes, outlandish wigs, and the exaggerated actions performed by the actors. The origin of Kabuki dates back to the early 17th century where women performed through dancing and acting. However due to issues the government banned women from the Kabuki theatre and since then only men are allowed up on stage. At the early 18th century, the art of Kabuki became established that became what it is today with the over dramatic presentation and seriousness of the play. The plots of Kabuki is usually based on historical events, warm hearted dramas, moral conflicts, love stories, tales of tragedy of conspiracy, or other well-known stories. However what makes Kabuki performance unique is that they only the best part of the story rather then the entire story. Another specialty of the kabuki stage is the foot bridge or hanamichi. It is a long narrow stage in the middle of the audience where the actors will make their dramatic entrance or exit during the play. Discover a new side of Japan with this traditional performance art and make your trip in Japan an even more memorable experience!